The Grand Canyon is best-known for its killer views and exposed ancient rock, but the national park is home to 355 different birds, 89 types of mammals and 56 reptile and amphibian species. Perhaps you’ll be lucky enough to see some of this wildlife on your visit. Here’s the lowdown on a few animals to look out for. These rare birds (only a few hundred remain in the world) may be spotted flying around the canyon. 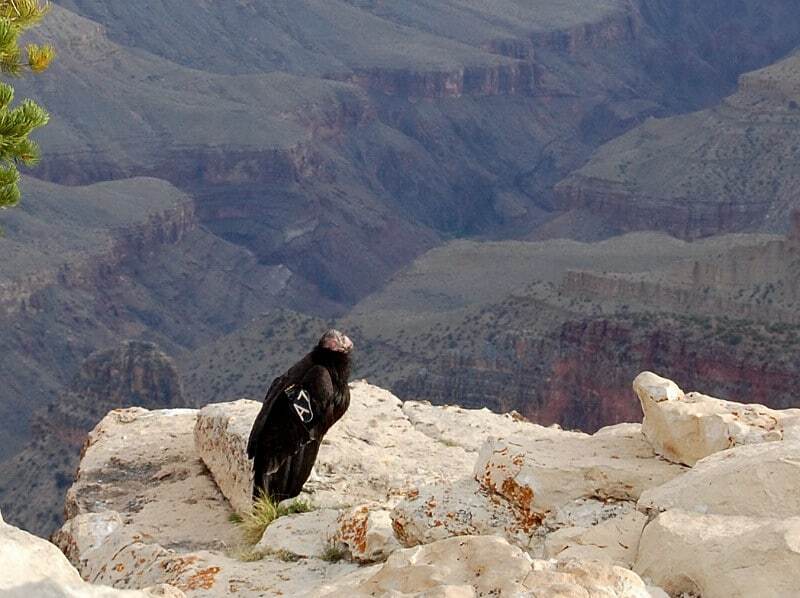 My biggest wildlife thrill ever came in 2009 when I saw a condor sitting on a rock just 15 feet away from me at the North Rim. At the time, less than 200 condors existed in the wild, so it was thrilling to see one so close. The ranger told gawkers that the bird actually shouldn’t let people get so close, and he was worried about it. The bird, number A7, as you can see from its marking, had flown away by the time I returned 20 minutes later. I love me some bighorn sheep. I like that they’re only found in very specific high-altitude locations. While I spotted several bighorn sheep in the Badlands, I didn’t see any at the Grand Canyon, because they are typically found at the South Rim and I was on the opposite side. Sometimes, they even walk right out into roads and trails, leaving drivers and hikers with great footage of up-close wildlife encounters. Both rims are home to various kinds of squirrels. The unique Kaibab squirrel, which has a black belly and white tail, lives in the North Rim and can be found only in Northern Arizona. 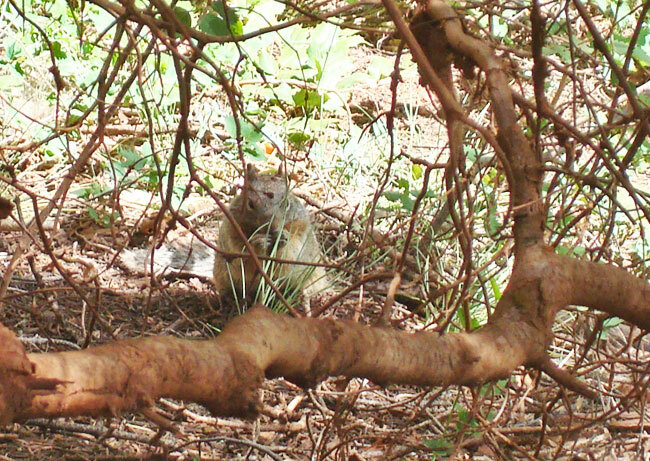 I spotted a few squirrels hiding behind tree branches, but I don’t believe any were of the Kaibab variety. Geckos, the cutest lizard if you ask me, are found along the Colorado River. A threatened species, the desert gopher tortoise, is found in the scrub in the western side of the park. In terms of more visible creatures, the mountain short-horned lizard is abundant around the forests near the rim. 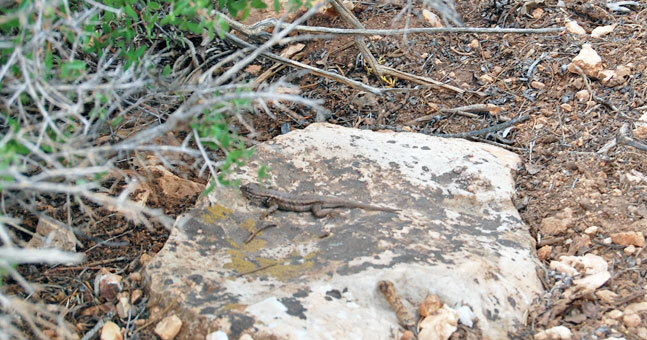 You’ll probably spot a few if you do any hiking into the Grand Canyon, along with salamanders and toads. The NPS page on the Grand Canyon warns that solo hikers may be at risk for attack by mountain lions, but there has never been a known attack at the canyon. Mountain lions (pumas/cougars/panthers) are commonly found on both sides of the park, but they keep their distance, so visitors don’t see these animals often. Always watch where you’re walking. Snake bites are rare but can happen. Scorpions are seen often in the canyon and according to the NPS site, “stings occur with regularity.” They may hurt but rarely cause serious damage. These aren’t the scorpions that can kill you. Among the mammals found in the national park are 51 different rodents and 20 types of bats. 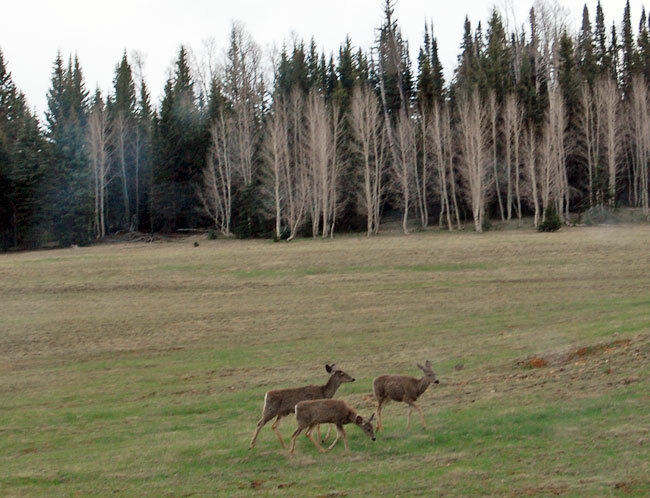 Mule deer, elk and coyote are present, but you’re more likely to see smaller animals like skunks, raccoons, porcupines and beavers. You may run across lots of different kinds of spiders at the higher elevations, including black widows and tarantulas. Scary! And if you make it to the river, you may encounter all kinds of fish, crustaceans and amphibians. The wildlife at the canyon is much more diverse than I would have expected. What animal would you like to see if you visited the Grand Canyon? I hiked across the Grand Canyon in 1996. I definitely did not see any bears and do not recall seeing anything except some birds and squirrels. I did encounter a black bear and two cubs when I visited the Great Smokey Mountains in Tennessee. Great write up. Used to answer some questions for my homeschool daughter. We visited the canyon this past May, as my wife and I ran in the Grand Canyon Half Marathon. Wow, running a half marathon in the canyon sounds like an exhausting and memorable experience! Thanks for reading. Wow, wildlife at its best. Beautiful and amazing pictures mate. Cheers! Grand Canyon is indeed the fascinating place. I love the colour..so terracotta..
I’ve never been to the Grand Canyon. But I’ve always wanted to do a helicopter ride up there because like you said, “killer views.” I just didn’t really think about all the wildlife. So interesting to see these. The day I go, I’ll be sure to keep my eyes open beyond the views – although that might a little difficult. The copter trip would be amazing. I would like to try that someday. There are at least a dozen different ways to visit the Grand Canyon. Condor, definitely condor. I saw one in Bolivia about 5 years ago at the Colcha Canyon. We’d just hiked down into the canyon and back out and were on a bus back to Huaraz. All of a sudden there was a giant condor flying alongside the bus. It glided along with us for what felt like ages! I am less adventurous as time goes on. I fear what I can not control in animals and rodents, and spiders, and other insects. They just unnerve me and cause me to crumble in tears. Just not brave. I like the pictures of the deer and other animals at a distance. I guess that’s better than being naive and not fearing them at all! I tend to be oblivious and naive when it comes to snakes and scorpions. I don’t even worry about them because I rarely see them. I should really start paying more attention when I hike! We were at the canyon a couple of days ago and my son was looking out his window and said he saw a bear. I assured him he didn’t, and he insisted he did. We turned around the car and sure enough, there was a black bear. We were able to get two pictures of him. The park ranger said he usually only sees one per year. We were on the south rim exploring the desert view having just left Grand view point. Pretty amazing! Wow, that’s a great story! Seeing bears at the canyon is a rare treat. I had no idea there’s so much wildlife in the Grand Canyon. I would LOVE to see the bears. Me too, but I’d settle for bighorn sheep. Cool shots!! Were you lucky to see the animals you did, or is the Grand Canyon fairly abundant in wildlife? It seems more abundant the further down into the canyon you go. The rims don’t seem to offer as much.